What a great day for a ‘cross race! This race has typically fallen on a cold, rainy, and windy day – but not this year! We had an absolutely gorgeous and sunny fall day. No arm warmers or base layers needed! The guys at Geoff’s Bike & Ski put together a really fun course, complete with a sand pit, an uphill log-over, some gnarly roots and plenty of fast and flowy sections. The course even went right through the outdoor patio at Bobber’s Grill. This made for great spectating! They also offered plenty of women’s categories and actually ran the Women’s Masters race at a different time than the Women’s Open so women could double up if interested (which doesn’t happen very often). At the start line we were quite confused when the officials had the Women’s 3/4 field line up ahead of the Women’s Open field and Men’s 3/4 field. Racers from all fields and even the guys from Geoff’s (aka event organizers) strongly questioned this… only to have the official say that was the way it was going to be. It just did not make sense and wasn’t safe to send out the Beginner Women 30 seconds before a charging Open field and 60 seconds before the men’s field. The head official tried to reason they were doing it this way because they didn’t want lapped riders; however I’m not sure how a 30 second gap would accomplish this. All of us trying to figure out what what going on at the start! As a beginner, I would have been absolutely terrified! It’s one thing to start behind the faster classes and then have them spread out and trickle through if/when they lap you. It’s downright scary and not safe to have the entire field out there passing you at once! To drive the point of how ridiculous this was, can you image sending the cat 5 men out 30 seconds in front of the Men’s Open race? I didn’t think so. (I think the official must have just been having an off day – there aren’t usually issues like this). Anyways, back to the racing! My goal was to stick a wheel and stay with Robin or Brittany for as long as possible, expecting them to be in the lead from the start. 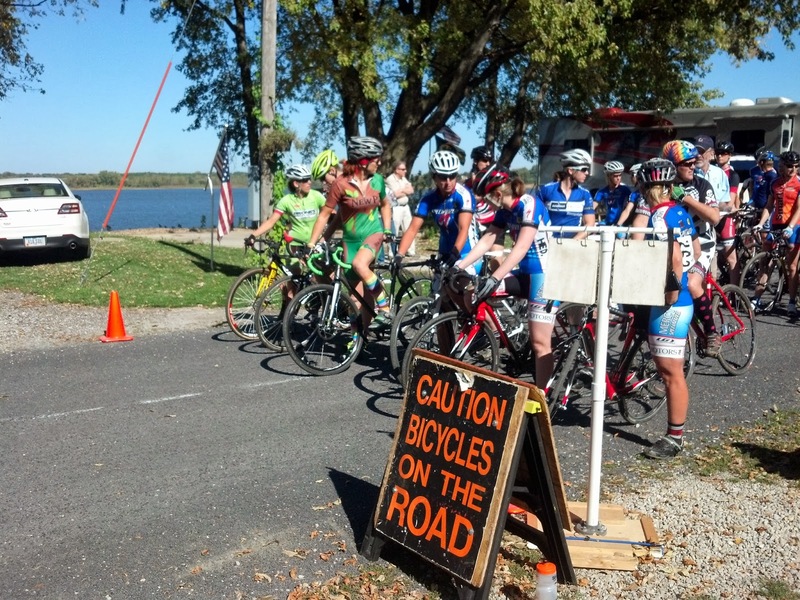 The Women’s 3/4 field took off and before we knew it, we too were off! I had a great start and was in the lead going into the first obstacle, the gnarly roots. Wait, what? I was supposed to be following a wheel, not in the lead! It was like I didn’t know what to do – things were not going as planned (yes, I know this sounds crazy, but it was completely unexpected and I panicked a little). It was as if everything was happening in slow motion, I looked to my right and saw Robin riding the roots (badass) and then saw Darcy and Brittany running by. I finally snapped back into reality and ran over the root, jumped back on my bike and tried to chase back up to the group. I saw Robin, Britt, and Darcy just ahead and watched them get around a couple Cat. 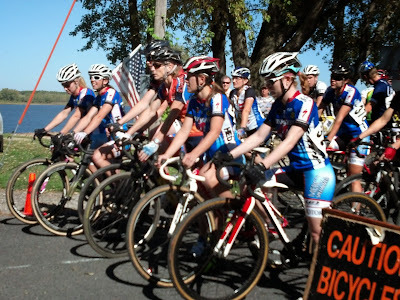 3/4 women right before a tight, twisting section of the course. I caught up to the Cat. 3/4 women right as they were entering this section and lost my chance to catch up to the leaders. In the following open section I continued chasing and was able to pass a few more ladies from the beginner’s race, while trying to keep the leaders of the open race in my sight. I got to the uphill log over and dismounted to run over it and up the hill. I actually ran up the hill (I’m patting my back here). I rode on to the steep uphill, and then over to the barriers and then on to the sand pit. I was about 1/3rd of the way through and had to dismount because the girl directly ahead didn’t make it. I again ran(!) and hopped back on my bike to ride to the start/finish area, the leaders no longer in my sight. Photo by Tara Coady. Thank you for capturing me riding the sand! Things were still a little congested in the second lap and I had to get off my bike on the steep uphill and the sand pit due to riders from the beginners race dismounting right in front of me. By the third lap, things were thankfully much more spread out. I was passed by two racers in the open, but fought to stay with them. Usually I get pretty deflated by getting passed, but I was able to get over it and keep going hard. Mentally, this is/was something big for me to overcome. I yo-yoed for a while and then with two laps to go made a pass. I was able to make the pass stick and finished 5th. With such a strong field of ladies, I’ll take it! And I will admit that I wouldn’t have been able to hang on to the lead group the entire race, maybe not even an entire lap, but I was a little frustrated to get stuck behind lap traffic right away and not get the chance. It was of course in absolutely no way the fault of any of the other riders, just poor planning by the officials. Aaron and I were chatting about the races later that evening and he pointed out that I basically came to a stop when dismounting for obstacles, such as the roots and the log. I hadn’t even realized I was consistently treating these differently than the barriers, which I do fairly smoothly. I’ll have to be more conscious of that for next time. I’m glad the men’s & women’s open race at different times so Aaron can spot things like this that I would never realize! And speaking of Aaron, he had a fabulous day of racing. He took the win in the single speed race and then went on to finish 3rd in the men’s open. So proud! Jerome, Kevin, Britt, Kevin, and Aaron at the start of the singlespeed race.